Simply the "Greatest" companion anyone could ask for. Our 9 years together watching the love in your eyes, gentleness, and our walks together will never be forgotten. The pain has been great, as I maintain your grave. I pray that God is taking care of my little girl. Mark, first of all let me take the time to tell you how sorry I am for your loss. It is so very hard to lose a wonderful pet. But your memories will help you through the long grieving process. 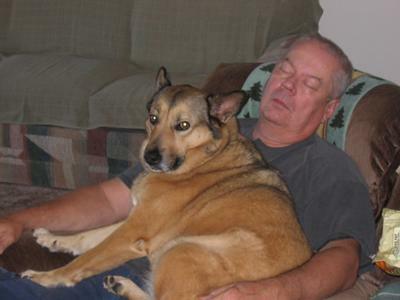 Thank you again for sharing your story about your Dog, Bogey, here with us all. It is just over 5 years since I lost this GREAT GSD. Still missed and talked about by those who shared her life and enjoyed her personality. May we meet again Bogey. Master Mark. Still thinking of Bogey, our great and few bad times. LOVE YOU BOGA. Losing the worlds greatest dog is rough. It has been 3 years now since I buried Bogey on the hillside by pond. Bogey was born March 5, 2000 and died 7-3-2009 from kidney failure the result of a seizure. We met when I heard a tradio ad of free German Shepherd pups before they go to Marion pound. I couldn't resist and drove t5o residence where I saw a light brown pup, struting across yard. I asked about a male, but was told only 4 females were left. Oh boy, how to choose a pup when all are cute. I put my hand down in front of pups and got the most gentle tounge kiss ever, not a lick.